A theme is an idea that runs throughout a text. In An Inspector Calls, the themes of social responsibility, age, gender and class are explored. An Inspector Calls was first performed in the UK just after the end of World War Two, in 1946. 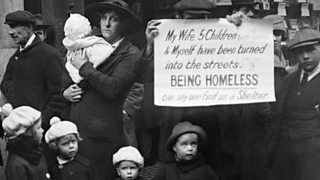 It was a time of great change in Britain and many writers were concerned with the welfare of the poor. At that time there was no assistance for people who could not afford to look after themselves. Priestley wanted to address this issue. He also felt that if people were more considerate of one another, it would improve quality of life for all. This is why social responsibility is a key theme of the play. Priestley wanted his audience to be responsible for their own behaviour and responsible for the welfare of others. How is the theme of social responsibility shown in the play? How does Priestley show this? Sheila is shocked when she learns that she had a part to play in Eva’s death. "All right Gerald, you needn't look at me like that. At least I'm trying to tell the truth. I expect you’ve done things you’re ashamed of too." Sheila takes responsibility for her actions and tells the truth. Gerald is being judgemental of her even though he has not yet taken responsibility for his own actions. Mr Birling refuses to take any responsibility for Eva Smith’s death. "If we were all responsible for everything that happened to everybody we'd had anything to do with, it would be very awkward, wouldn't it?" Mr Birling dismisses the idea that we should be responsible for each other, suggesting that such a situation would be 'awkward'. Eric shows that he takes responsibility for his actions in the final act of the play. "I don't see much nonsense about it when a girl goes and kills herself. You lot may be letting yourselves out nicely, but I can't. Nor can mother. We did her in all right." Eric clearly shows that he has a sense of social responsibility. Whilst Gerald and Eric's parents are enjoying being in the clear, Eric still takes the matter of Eva's death very seriously. He is even brave enough to tell his mother that she should feel responsible too. Sybil Birling will not take any responsibility for the death of Eva Smith even after she has been questioned by the Inspector. "I should think not. Eric, I'm absolutely ashamed of you." In telling Eric that she is ashamed of him she shows that she has learned nothing from the Inspector’s investigation. The audience would know that she is in no position to be questioning the behaviour of anyone else given her own treatment of Eva Smith and lack of social responsibility. When the Inspector is questioning the Birlings. "It's better to ask for the earth than to take it." Here the Inspector is suggesting that it is socially irresponsible to be greedy and 'take' things without permission. This is a practice the privileged Birlings would be used to. How does Priestley explore the theme of social responsibility in An Inspector Calls? Eva Smith dies because no one takes responsibility for their actions against her. Sheila and Eric develop a sense of social responsibility during the course of the play. Mr and Mrs Birling do not develop any sense of responsibility and are made to look even more foolish at the end of the play. The Inspector teaches a number of lessons about how we should be responsible for each other. Priestley uses the events of the play to suggest that if we do not take responsibility for each other the world will become a terrible place.